It was a dark and stormy night... What could be more perfect for Halloween. The Collectible Minifigure Monsters need a home. Enter their haunted house, a four level structure (with elements inspired by the Scooby Doo Mystery Mansion) that fits with other modular builds on a 32x32 base plate. The floor can be removed and two panels on either side of the two fireplaces are hinged to allow easier access to the interior. The Monster Scientist is hard at work creating new creatures à la “Island of Dr. Moreau” in his subterranean lab. In the processing chamber is his latest creation, the Fly Monster. The Tiger Woman, one of the scientist’s first endeavors, is overseeing the transformation. Meanwhile, the giant Hagrid assists the Monster Rocker by touching up the creature’s green complexion. The lab opens to a large greenhouse where Seymore, an extra large venus flytrap with an appetite for more than bugs, and his best friends from the “Little Shop of Horrors” including the Plant Monster await unsuspecting guests. Square Foot is outside ready to harvest the latest crop of pumpkins that are guarded not too successfully by the Scarecrow. The Zombie Pirate captain, sword at the ready, greats trick or treaters at the main entrance to the house. Three halloween revelers, a costumed Hippie dad and his two children dressed as the Skeleton Guy and an unconvincing witch, anxiously descend the steep stairs from the house happy to escape with their lives. The iconic stretching paintings from Disney’s Haunted Mansion grace either wall of the main hall behind the captain. A chesterfield facing an old grandfather clock make a cozy “unliving” room. The captain’s zombie pals, the Cheerleader and Businessman, relax at the kitchen table and discuss news items the latest edition of the Zombie Times. They appear not to be interested in their brain sandwich at the moment. Also in the kitchen is the Wacky Witch who is brewing an unappetizing potion simmering in a cauldron in the kitchen’s fireplace. To the right of the main entrance is the music room and library. The Spider Lady is about to sit down a play her favorite music piece “This is Halloween” on the piano or perhaps she may change her mind and decide to sit by the second fireplace and read a horror novel from the library. Going up either set of spiral staircases leads to the main bedroom of the haunted house. Wednesday, aka the Spooky Girl, carrying her favorite teddy bear enters the main bedroom which contains a bed where the witches cat has decided to take a nap, a dresser, lamp, and old style radio. Her father, The Count, is resting in his coffin off to the side. To the rear of the bedroom is a closed door that opens onto a bloody bathroom scene (inspired by B Rick’s Horror bathroom). The evil side of Mr. Good and Evil has truly come out on this haunted eve. A poor unsuspecting trick or treater has been exsanguinated in the bathtub by Mr. Evil and reawakens to the horror of his new undead state. On either size of the bedroom and bathroom are storage rooms. The storage room on the right can be entered through the picture of the Fat Lady. A lonely spirit ghost stares longingly at all that remains of his earthly self, that being his skull which watches over the room since the valuables of the house are stored in the safe and chest located here. The Wolf Guy, in his wolf man state rather than his more unassuming guise as the Lumberjack, stares out the front dormer window salivating over the easy pickings of trick or treaters on the streets below. If only he weren’t trapped in this room with the sleeping vampire guarding the exit. On the rooftop level, the ominous figure of the Specter watches the scene below. A naughty Monster is locked in one of the attic spaces. Over looking the rear of the house the Banshee wails for her long lost love as the Gargoyle enjoys spinning around as the hours pass. A owl peers at the black decorative owls that adorn the roof line. Hope you enjoy my haunted house. 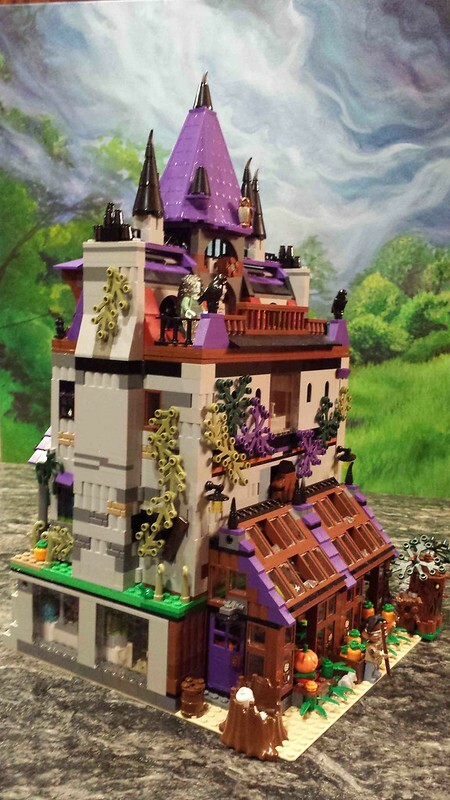 Wow loads of detail, really col, wanted to do something similar myself for halloween (I was tempted to buy the Scooby Doo mansion for this very reason), but on a smaller scale, now I know where to look for inspiration! I really like the look you have achieved from the front and I kinda like the little bloody bathroom scene. One small enhancement I would suggest, and I am in no way an expert, so I am not pretending I could do better on something so big, but some of your details are lost in the photographs because the lighting seems to be a bit off. Its too bright and casting too many shadows in places, could you find a different place to photograph to remove the glare you get and get multiple sources of light in to reduced the shadows? Thanks for the kind words. I know the pictures could be better, sorry about that. I used the phone on my camera since it was the most expedient but not the best quality. Here are two more exterior photos with hopefully less glare. Oh I use my camera phone too at the moment (I dropped my proper camera on holiday and now it just makes buzzing noises), I only mentioned it because I have been playing around with taking photos myself to try and get better results, but I know for myself that I have a lot to learn! Wow nice job! I really like all the small details you put in! Keep up the great work! I dig this totally and it's chock full of fantastic interior detail and a great overall building form. Youve taken a good set and totally revamped it brilliantly. The chimney looks great and the rear sun room is perfect. The roof is excellent, the balconies are sweet and the extra levels with basement are sweet. I.ve been thinking on it and I Reckon for it to be more modular it needs some architectural detail at the ground floor ceiling to first floor interface and roof gutter line. Architraves, frieze and cornices maybe using inverted slopes and modified plates- maybe even some arches. Maybe a porch or verandah. Some horizontal bands that protrude out a little. Maybe some window shutters too. Or not. Interested to know your thoughts. This is what the mystery mansion lacks imho. Looking at the haunted house and other modular - they all do this to varying degrees. The facades are flat but have these features. Also I like the weird angles in the mystery mansion. But to do this on a larger scale might not work. I agree the first floor overhang could use some architectural detail. I tried using some inverted curves pieces like those on the roof line of the Grand Emporium but I did not have enough to make it look good. They just appeared to be hanging there. I like your idea of inverted slope pieces and will try that to see how it looks or maybe using a large arch and the inverted curve pieces leading back to the door area off of it. If it works I will submit the results. 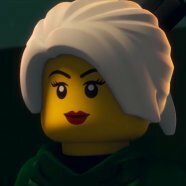 Unfortunately I do not own any window shutters so that is why my MOC does not have any. I like the weird angles in the mystery mansion but did not want them in mine. I found them too cartoony for the modular build. Thanks again for the advice. I have altered the front facade to incorporate your suggestions and I like the results. I added inverted slope pieces, a light and some curves to the underside of the first floor overhang. I added regular slope pieces to the top of this section. I think to looks more complete now. https://farm1.staticflickr.com/730/21161466154_47a7149d68.jpg' alt='21161466154_47a7149d68.jpg'>new hh front2 by Karen Metz, on Flickr[/img]Thanks again for the advice. Impressive build, and so many little details, the more I look the more I spot, nicely done. I have finished my last tweaks to my haunted house. Hopefully these pictures are better quality with less glare. Since I didn't have any proper Lego shutters I made my own and have added them to the front facade. A couple of more outside pictures. I have slightly modified the bathroom. I have added a writing area to the living room under the stairs. Also slight modifications to the kitchen. The Count has come out of his coffin. He has a fondness for capes and enjoys making his own. Some other random shots from around the house. That's it. Happy Halloween everyone. any way i can get to see them please ?